If you are a big time Britney Spears fan, be prepared to be disappointed. While many of you may prance around loving her newest hit “Hold It Against Me” I was floored when I first listened to it, which was after I bought it. Bad decision. The past few months as I have dove head first into music research, ones music producer and production and new artist information, I have realized how little talent some of the biggest artists in the industry really have. If you haven’t already read about Puff Daddy, P Diddy- whatever he calls himself these days definitely read up on my discoveries. As for Britney Spears, I can’t say I have ever read more mind blowing information in my life. If you read further you too can get a glimpse of the information I have learned on our pop diva Britney Spears. So my story begins with a professional, highly acclaimed and successful swedish music producer by the name of Max Martin. The backbone and talent of all of Spears work excluding two albums (“In The Zone” and “Blackout”). Also the talent behind other artists work such as Kelly Clarkson, Backstreet Boys, Pink, NSYNC and Katy Perry. However, when pop princess Spears decided she wanted to move away from the teenage pop genre of music, she did so by parting ways with our man Max Martin. After Blackout, Spears obviously realized how much she depended on Martin and asked him to take part in the production of her last album “Circus”. Oh and remember “If U Seek Amy” and its hidden meaning F-U-C-K-M-E, oh yes that song was written and produced entirely by… you’ll never guess… Max Martin. Now that you think this information is just peachy, what I left out was that your childhood listening and looking up to Britney Spears was a complete sham. Who you were really relating to within the songs was Max Martin. Devastating right? Up until 2000 Martin worked under Cheiron Studios and then went on to work under his own production company, Maratone. The information that has been left out of every single interview, article and show on Spears is the entirety of what Cheiron and Max Martin contributed to her career as a pop singer. What is left out is the fact that unlike Cheiron, most other divisions have the artist writing the songs and then hiring a producer to help discover and shape the sound. At Cheiron it was the other way around; the producers wrote the songs, played the instruments, engineered and mixed the recordings and the artist was only brought in near the end of the process to do the vocals. I think the best example from what I read was Britney Spears’s second studio album “Oops!… I Did It Again”. For this album Cheiron had already written seven songs and then had proceeded to record the layers of music before Britney even arrived at the studios in early November of 1999. Wow, tough job Brit, and to think you went crazy a half a decade later. To sum this example up, it took her only one week to do the vocals. God Bless the real talent. When I look back on all the songs of Spears I BOUGHT, epitomized and learned the dance moves for, I should have been paying my respects to Max Martin for changing my life. On a side note it’s comforting to still know that Spice Girls wrote their own songs. So now that the secrets are out in the open, I have started my unanswered search with the question “Why is Spears newest track “Hold It Against Me” so incredibly bad? The song has zero lyrical content, the base belongs to Benny Benassi and I couldn’t even tell you what range of notes she is singing/ talking in. It is like Paris Hilton singing on one of David Guetta’s tracks, it not only doesn’t mix but it makes you think that both parties were crazy to think it went. If Spears is trying to switch genres of music… again, by all means go ahead, but when your overall sound is pop, you can’t just start collaborating with Linkin’ Park. Please. 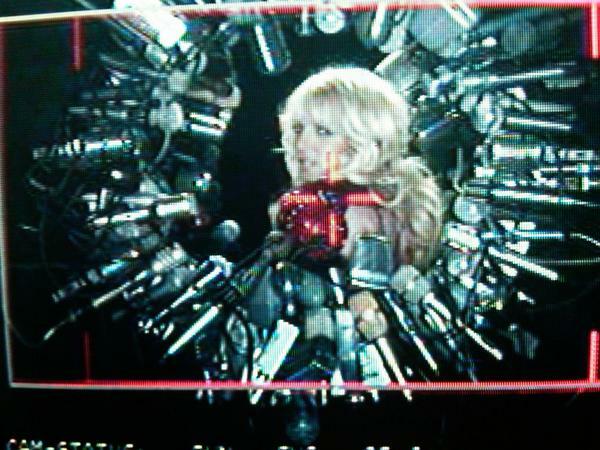 Photo Tweeted by Ms. Spears on Sunday night after the music video for H.I.A.M wrapped. The three factors which can be held responsible for such a horrible track fall onto the music producer, the songwriter and the artist. Considering the song was produced by hit makers Max Martin (DJ Got Us Fallin’ In Love, Dynamite) and Dr. Luke (California Gurls, We Are Who We Are), I can’t think of a song off the top of my head I didn’t like by the two. Now we all know Spears went on a crazy streak shaving her head, holding her kids hostage and parading around town like she was dropped on Mars, but I wanted to look into the songwriter before I blamed the inevitable on Ms. Spears. Come to find out “Hold It Against Me” was written by the same person that wrote “Teenage Dream” by Katy Perry. Bonnie Mckee. Under her belt she has a total of seven songs written for other artists…. If you have any common knowledge of song writing that is not many. Just because she wrote “California Gurls” and “Dynamite”, I am not convinced she is not the guilty one for this bad song. Lets think about it logically, Britney Spears is a money tree. Someone could write a song about trash bags and if Spears sang to it, it would sell. That’s just the way this industry is. So with that said, I think it is partially everyones fault, to think this was actually a good track. Then again, what did any of them have to lose? Smart people. They threw it out there, knew these airheads would buy it without listening to it (like myself) and before people realized it was a horrible song, they will have already made the money to make up for the work they put in. That is- the work that obviously Dr. Luke and Max Martin put in. Another Thank you to Britney for contributing your voice, which as we can all tell from the likes of “Hold It Against Me” has gone downhill faster than your marriage to Kevin Federline. I hear the video is supposed to be good…. I seriously can only hope. Now check out the version that leaked with Bonnie Mckee vocals… what do you think? You may be right about her music, but let’s face it, she has a lure to her. I hope she gets back on track, let’s face it, the public WILL hold it against her.